Mixing: All Reusche colours come in a powder form and need to be mixed with a vehicle (binder & medium) before application. 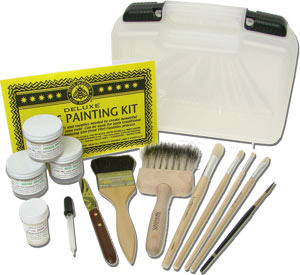 Each glass painting kit includes Gum Arabic, and two different types of mixing mediums. Start with the colour. Place a small amount onto a ground glass slab and flatten the colour to approximately 1/8” thick. Sprinkle the Gum Arabic over the colour, just enough to look like freshly fallen snow. You should be able to see colour underneath. Add water in small amounts mixing between additions. You want a consistency similar to yogurt. The paint should be soft but retain its shape. It the colour spreads out on your slab, it is too thin. More colour can be added to the mixture to thicken. The recommended ratio for mixing with most mediums for hand painting is 80 % colour by weight to 20 % medium by weight. Weigh your colour, add your medium, and mix to a smooth consistency similar to yogurt. There are many different oils and mediums that can be used for mixing your colour.